G & M Painting, LLC is proud to offer Deck Staining in North Augusta South Carolina. We also provide Deck Restoration in North Augusta South Carolina. Sun exposure, wind and rain can damage the surface of your North Augusta South Carolina deck in no time! UV rays and moisture can damage deck surfaces that have lost their protective seal. 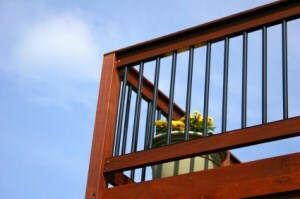 let the experts at G & M Painting, LLC restore your deck's beauty and protect your investment. G & M Painting, LLC deck painting and staining specialists have years of experience in caring for North Augusta South Carolina decks. When it comes to long lasting, cost-effective deck staining, in North Augusta, South Carolina, G & M Painting, LLC is the North Augusta deck restoration specialist that North Augusta residents trust. "These guys were professional , fast , and friendly! They did a great job on painting our entire house, and also did it for a competitive affordable price. And then to top off the great service, they did the trim around our windows and doors for free! We would definitely hire them again, and will be referring them to everyone we know. "Les and his team were courteous, on time, clean, professional. I recommend Les and his team to anyone- they were fantastic. Outstanding group of people." "Excellent work, professional conduct, spotless clean up daily!" "Very professional and quality workmanship!" "My painting project was the outside ( my house ). Which turned out great and they finished early. I also plan on having them back for the inside painting." "Les was great. He had wonderful customer service skills and was very accomodating to my schedule; arriving on time and never kept me waiting. He was very straightforward with his pricing. I would recommend him to anyone who needs painting and drywall services." "We had 4 rooms painted in our house by Les and his team. They were professional, clean and did a fantastic job! They quoted us almost half the cost and 2 days less than a competitor. We have a couple of other projects we are thinking about and would definitely hire G&M Painting again." "This contractor is the best! Les Meyers and his crew were the most respectful of my property, behaved so appropriately in my home and there performance was extra ordinary, above and beyond any paint contractor I have ever hired. The finished appearance is so beautiful. They installed crown molding in my bath and the midered corners are just perfect. EXCELLENT job and then some!" "From the estimate to the finished job, the experience was prompt, professsional, friendly, helpful. The quality of work was excellent. I even had to reschedule the job at the last minute due to a sudden death in the family. The response was "No problem, call when you are ready to proceed". I have already recommended this company to my daughter." "G&M Painting was priced fairly and got the job done fast. We appreciated the extra effort by Les to resolve a ceiling issue. Thanks!" "Les, and his crew were timely, proficient, and professional through out the process, I would definitely recommend them to others (and i have), and I will definitely use them in the future." "The crew was professional, on time, and finished in 1 day. Very responsible, I left The crew in my home alone for the entire day and the house turned out great and was always willing to do extra if needed." "Nice guys very professional. Work was done quickly, and they did an excellent clean up after. I was very happy with the job. Would recommend them to family, and friends."